Select a data visualization here. Select several countries to compare data. Select a year between 2012 and 2017. The Henley & Partners – Kochenov Quality of Nationality Index (QNI) provides a comprehensive ranking of the quality of nationalities worldwide. To ensure a high level of reliability, a wide variety of strictly quantifiable data is used to gauge the opportunities and limitations that our nationalities impose on us. For that purpose, the QNI measures both the internal value of nationality, which refers to the quality of life and opportunities for personal growth within our country of origin, and the external value of nationality, which identifies the diversity and quality of opportunities that our nationality allows us to pursue outside our country of origin. The QNI is the result of a successful cooperation between Dr. Christian Kälin, the Chairman of Henley & Partners, the leading international residence and citizenship planning firm, and Prof. Dr. Dimitry Kochenov, a legal academic who has been writing about citizenship and teaching nationality and immigration law and policy for more than a decade. The 3rd edition of the QNI was co-edited by Prof. Kochenov and Justin Lindeboom. 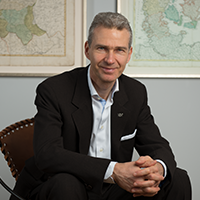 Dr. Christian H. Kälin, TEP, IMCM, Chairman of Henley & Partners, is considered one of the world’s foremost experts in investment migration and citizenship-by-investment, a field he pioneered. Holding master’s and PhD degrees in law from the University of Zurich, he is a sought-after speaker and advises governments and international organizations. He is the author, co-author, or editor of many publications, including standard works such as the Global Residence and Citizenship Handbook, Ius Doni: The Acquisition of Citizenship by Investment, and the Switzerland Business & Investment Handbook. Prof. Dr. Kochenov holds a Chair in EU Constitutional Law at the University of Groningen in the Netherlands and chairs the Investment Migration Council, Switzerland. He has held numerous fellowships and visiting professorships worldwide, including at Princeton University (Crane Fellowship in Law and Public Affairs at the Woodrow Wilson School and Visiting Professorship at the Center for Human Values), NYU School of Law (Emile Noël Fellowship), Boston College Law School (Senior Clough Fellowship), Basel Institute for European Global Studies, and Osaka Graduate School of Law and Politics, as well as a Visiting Chair in Private Law (Citizenship) at the University of Turin, Italy. He publishes widely on different aspects of comparative and European citizenship law and migration regulation, and he consults for governments and international organizations on EU constitutional law and citizenship issues. Prof. Kochenov’s latest edited volumes include EU Citizenship and Federalism: The Role of Rights (Cambridge University Press, 2017) and The Enforcement of EU Law and Values (Oxford University Press, 2017, with András Jakab, University of Salzburg). As the world has become both increasingly globalized and increasingly volatile, the need for greater travel freedom and improved safety and security has grown steadily. Across the economic spectrum, individuals want to transcend the constraints imposed on them by their country of origin and access business, education, career, and lifestyle opportunities on a global scale. Alternative residence and citizenship represent the most direct routes to global mobility and overall stability, since individuals who have residence or citizenship in multiple jurisdictions benefit from each country’s best practices and are less vulnerable to its risks and shortcomings. What is Residence- and Citizenship-by-Investment? In its most basic form, citizenship-by-investment denotes the process whereby qualified, vetted candidates are granted full citizenship in exchange for their substantial economic contribution to the passport-issuing state. Residence-by-investment denotes a similar process, but candidates in this case are granted temporary residence, which can be extended to permanent residence or, in some cases, citizenship. There is no a priori hierarchy between residence and citizenship programs. Each type of program has its advantages, and each will meet the needs of particular individuals and families. Residence-by-investment programs, for example, give ultra-high-net-worth individuals the option of physically relocating to a favorable jurisdiction — either now or during retirement — and becoming tax residents of that jurisdiction. Residents of a country have full legal rights, including the right to live, work, study, and receive healthcare in that country. Citizenship-by-investment programs, on the other hand, provide ultra-wealthy families with the privilege of a second or third passport, which affords them all the internal rights enjoyed by residents as well as the broader right of travel, trade, and settlement abroad. Henley & Partners is the global leader in residence and citizenship planning. Each year, hundreds of wealthy individuals, families, and their advisors rely on our expertise and experience in this area. The firm also runs a leading government advisory practice that has raised more than USD 7 billion in foreign direct investment. We have been involved in strategic consulting and the design, set-up, and operation of the world’s most successful residence and citizenship programs. Outlined below are the details of the most credible and successful programs in the residence and citizenship categories. These programs uphold the highest standards of due diligence, attracting carefully vetted individuals who bring capital, business networks, and talent to the country in question. In exchange for their contribution, successful applicants are granted full residence or citizenship, as the case may be. For more information on acquiring alternative residence or citizenship, please fill in your details via the enquiry box at the top of the page. 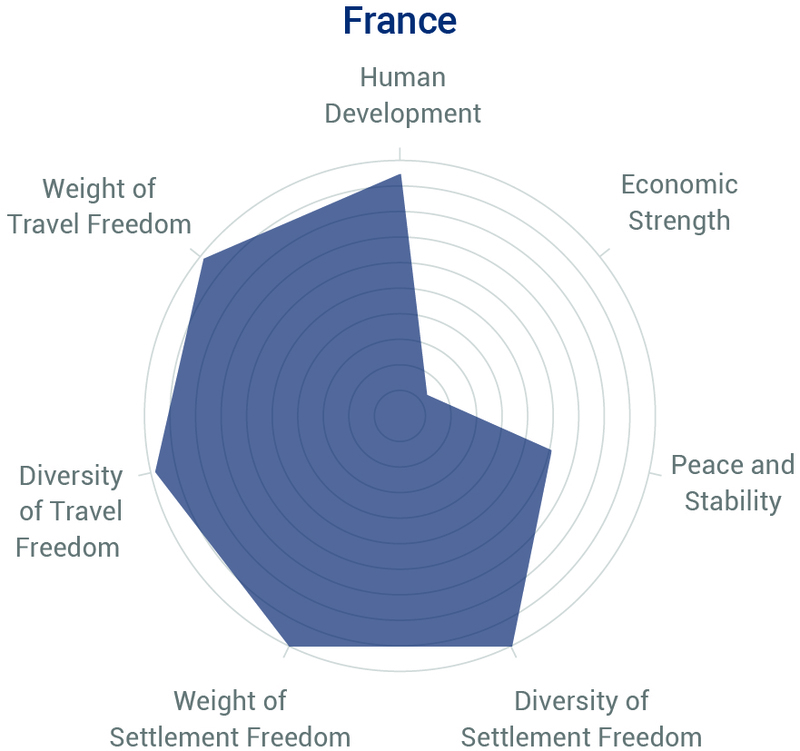 France’s quality of nationality is the best in the world, according to the 3rd edition of the Henley & Partners – Kochenov Quality of Nationality Index (QNI), which was launched in London today. The French nationality earned a score of 81.7% out of a possible 100%, fractionally ahead of Germany, which was knocked off the top spot for the first time in seven years, with a score of 81.6%. While the difference between France’s and Germany’s results is relatively small, France’s comparative advantage lies in its greater Settlement Freedom (attributable mainly to the country’s former colonial empire). Iceland and Denmark take 3rd and 4th place, respectively, on this year’s Index, which is the only one of its kind that objectively measures and ranks all the world’s nationalities as legal statuses through which to develop your talents and business. The UK drops down a position to 13th place, again failing to secure a spot in the top 10, while the US increases its position by two ranks, claiming 27th place, with the country’s relatively poor standing on the Index primarily due to its low Settlement Freedom compared to EU member states. China climbs two places to rank 59th, and Russia maintains its position at 63rd place on the Index. This year, the UAE has for the first time ever overtaken Israel on the QNI, now ranking 46th, with Israel in 48th position. The Emirati nationality has climbed 13 positions over the past five years, making a significant leap forward when its holders received visa-free travel access to the Schengen Area in 2016. The 3rd edition of the QNI continues to interrogate the quality of British nationality against the looming specter of Brexit. A ‘hard Brexit’ would see the UK losing its settlement and work rights in 30 of the world’s leading states, overwhelmingly impairing the quality of its nationality. But it could also increase tension and competition between the UK and the rest of Europe and potentially destabilize the nationalities of EU member states that had hitherto enjoyed close ties to the UK. Year-on-year, Georgia and Ukraine are the biggest climbers globally, rising 20 and 19 positions, respectively. The ascent of both nations can largely be attributed to the visa-waivers they signed with the Schengen Area in 2017, which significantly increased their Travel Freedom scores. On the other end of the spectrum, the Iraqi nationality fell 15 positions — one of the biggest declines on the QNI. The nationality fell in value after visa restrictions were introduced by a large number of countries. Examining the results of the QNI over the past five years of measurement reveals some interesting shifts. Overall, Colombia has been the highest climber since 2013, rising 50 positions and improving its value by 14.6%. By contrast, the Qatari nationality has dropped massively as a result of regional diplomatic conflicts. In fact, despite a relatively strong starting point (56th place in 2013), the Qatari nationality has dropped more significantly over time than war-torn and unstable Libya, Syria, and Iraq. Its free-fall to 87th place in 2017 represents a 31-position decrease in total since 2013. Dr. Christian H. Kälin, co-creator of the QNI and Group Chairman of Henley & Partners, says the Index is highly relevant to individuals interested in understanding the circumstances associated with their nationality, as well as to governments looking to improve the local, regional, and global reach of the nationalities they provide. The QNI provides a comprehensive ranking of the quality of nationalities worldwide. To ensure a high level of reliability, a wide variety of strictly quantifiable data is used to gauge the opportunities and limitations that our nationalities impose on us. For that purpose, the QNI measures both the internal value of nationality, which refers to the quality of life and opportunities for personal growth within our country of origin, and the external value of nationality, which identifies the diversity and quality of opportunities that our nationality allows us to pursue outside our country of origin. All the sources used are objectively verifiable and build on data collected by leading international institutions and experts with impeccable reputations. The QNI will be of interest to anyone who is curious about how their nationality performs in comparison to other nationalities and about the local, regional, and global opportunities and limitations associated with their nationality. The Index is of particular significance to financially independent individuals who wish to acquire the benefits of alternative citizenship: these individuals can use the QNI as a reference tool when selecting the most valuable second or third nationality for themselves and their families. The French nationality stands at the top of the QNI General Ranking, with a score of 81.7%, while the Somalian nationality lies at the bottom, with 13.4%. The global mean this year was 39.28%, an incremental decrease from last year’s average of 39.32%. In 13th place, the UK narrowly misses the top 10 but still makes it into the Extremely High Quality tier, with a score of 78.2%. The US has again only managed to secure a spot in the Very High Quality tier, but it did increase its position by two ranks, claiming 27th place and scoring 69.4%. 26 nationalities fall in the Extremely High Quality tier (75.00% and above); 23 nationalities fall in the Very High Quality tier (between 50.00% and 74.99%); 50 nationalities fall in the High Quality tier (between 35.00% and 49.99%); 96 nationalities fall in the Medium Quality tier (between 20.00% and 34.99%); and 14 nationalities fall in the Low Quality tier (below 19.99%). Malta and Latvia moved down from Extremely High Quality to Very High Quality; Andorra moved down from High Quality to Very High Quality; Ukraine and Georgia moved up from Medium Quality to High Quality; Qatar moved down from High Quality to Medium Quality; and Djibouti moved up from Low Quality to Medium Quality. The Georgian nationality experienced a spectacular rise of 20 positions, from 104th position on last year’s General Ranking to 84th position this year. Its improved ranking was mainly caused by a significant increase in visa-free or visa-on-arrival travel destinations, linked to its 2017 visa-waiver with the Schengen Area. The Ukrainian nationality experienced a similar dramatic rise, from 99th position in 2016 to 80th position in 2017, also as a result of visa-liberalization with the Schengen Area. Consequently, the Ukrainian nationality recovers towards the positions it occupied on the 2013 and 2014 QNI General Rankings (75th place with 32.8% in 2013, and 79th place with 32.3% in 2014), although the ongoing armed conflict in Ukraine continues to compromise the nationality’s Peace and Stability score. In the Seychelles, Human Development increased slightly, and the country gained five additional visa-free or visa-on-arrival travel destinations. As a result, the Seychelles nationality’s value increased by 2.6%. Gaining six positions, it entered the top 50 of the 2017 General Ranking in 49th position. In 2016, the Emirati nationality made a significant leap forward when its holders received visa-free travel access to the Schengen Area. The nationality of the United Arab Emirates continued this trend in 2017 with an additional 10 visa-free or visa-on-arrival travel destinations, now boasting 130 such destinations in total and overtaking the Israeli nationality as the best nationality in the region. As a result, it pushes further into the world’s top 50, moving from 49th place in 2016 to 46th place in 2017. The Qatari nationality suffered substantially from the country’s diplomatic conflict with Saudi Arabia and its allies. The Gulf states de facto suspended the application of the Gulf Cooperation Council legal framework to Qatar last year, which reduced the value of the Qatari nationality from 37.7% (70th place) to 34.1% (87th place) — a remarkable free-fall. The Iraqi nationality dropped 15 places, from 150th position (18.6%) to 165th position (15.1%). 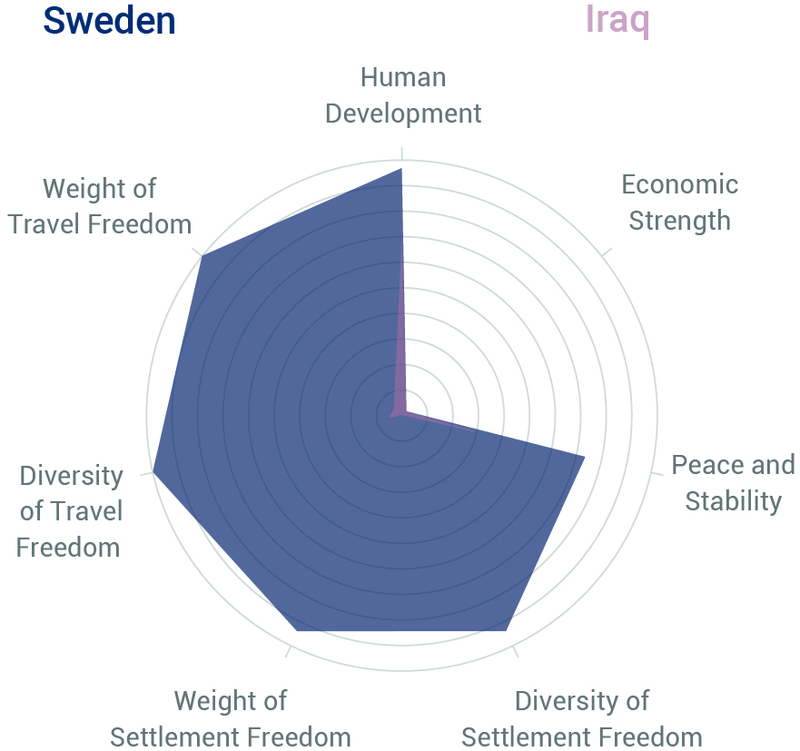 With Peace and Stability remaining equally poor last year, a large number of countries introduced travel restrictions for Iraqis, which caused the nationality’s Diversity of Travel Freedom to drop from 27 to only nine visa-free or visa-on-arrival travel destinations. The nationality of the Republic of the Congo (Brazzaville) fell in value from 21.3% in 2016 to 20.5% in 2017. The nationality’s 11-position drop is linked to a decrease in Peace and Stability as well as a decrease in visa-free and visa-on-arrival travel destinations. Overall, the Congolese nationality drops from 143rd position in last year’s edition to 154th position this year. The Kuwaiti nationality experienced a modest loss in value in 2017, which did, however, result in a 10-position drop on the General Ranking, partly because other nationalities simply performed better. With its external value remaining roughly equal, the level of Human Development in Kuwait decreased slightly, and the level of Peace and Stability decreased measurably. The Kuwaiti nationality fell from 72nd place (37.0%) to 82nd place (35.7%), further reinforcing its downward trend over the past five years. The value of the Colombian nationality has improved spectacularly over the past five years, during which period it has jumped from 111th place (26.1%) to 61st place (40.7%). While Human Development increased slightly, and Peace and Stability decreased somewhat, Colombian nationals have experienced a major improvement in Travel Freedom. In 2013, they had visa-free or visa-on-arrival travel access to 59 destinations, compared to 112 destinations in 2017, including the countries in the Schengen Area (as of 3 December 2015). The success story of the Colombian nationality over all the years of QNI measurement turns Colombia into the poster child of how to ensure constant improvement in the quality of nationality. As Libya has further destabilized over the past five years, its nationality has lost value on all the parameters of the QNI. Human Development, Economic Strength, and Peace and Stability have deteriorated substantially. While the global trend has definitely been increased visa liberalization, Libyan nationals went from having 39 visa-free or visa-on-arrival travel destinations in 2013 to having 38 such destinations in 2017. All in all, the nationality dropped in value from 22.4% in 2013 to 21.1% in 2017, only just staying in the Medium Quality tier. The nationality of Syria continues to suffer from the country’s ongoing civil war. With Syria’s economy destroyed, and Peace and Stability at an all-time low in 2017, Human Development has also decreased dramatically. Diversity of Travel Freedom also decreased from 37 to only 31 visa-free or visa-on-arrival destinations. Overall, the nationality’s value has dropped from 19.8% to 16.8%, moving it from 138th place in 2013 to 162nd place in 2017. 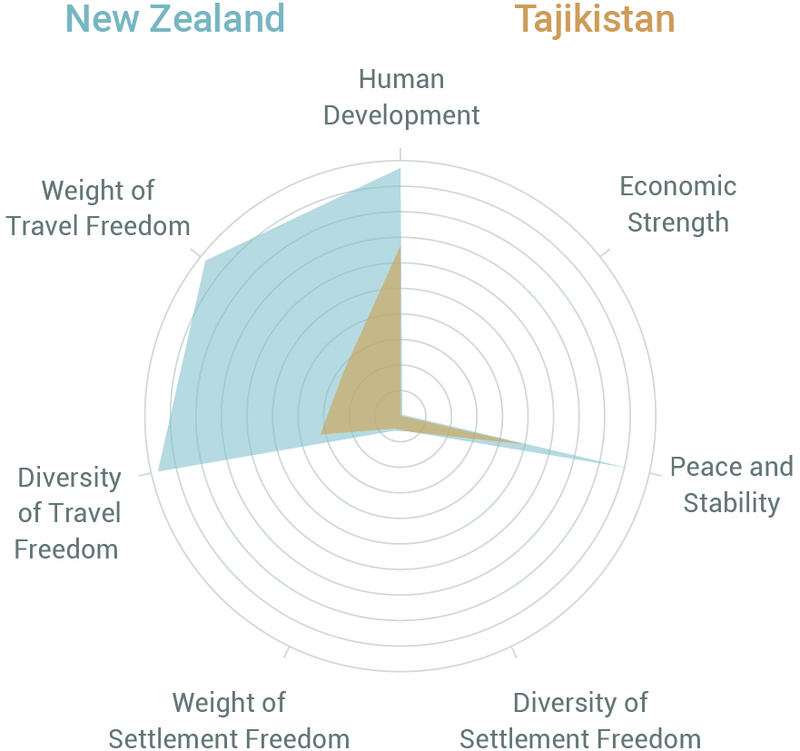 QNI infographics, radar graphs, and expert commentary essays are available for download on the Henley & Partners website (https://www.henleyglobal.com/quality-of-nationality/) as well as on the QNI website (https://www.nationalityindex.com/). 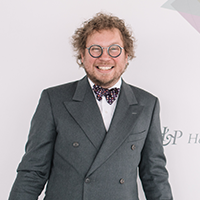 Prof. Dr. Dimitry Kochenov holds a Chair in EU Constitutional Law at the University of Groningen in the Netherlands and chairs the Investment Migration Council, Geneva, Switzerland. He has held numerous fellowships and visiting professorships worldwide, including at Princeton University (Crane Fellowship in Law and Public Affairs at the Woodrow Wilson School and Visiting Professorship at the Center for Human Values), NYU School of Law (Emile Noël Fellowship), Boston College Law School (Senior Clough Fellowship), Basel Institute for European Global Studies, and Osaka Graduate School of Law and Politics, as well as a Visiting Chair in Private Law (Citizenship) at the University of Turin, Italy. He publishes widely on different aspects of comparative and European citizenship law and migration regulation, and he consults for governments and international organizations on EU constitutional law and citizenship issues. Prof. Kochenov’s latest edited volumes include EU Citizenship and Federalism: The Role of Rights (Cambridge University Press, 2017) and The Enforcement of EU Law and Values (Oxford University Press, 2017, with András Jakab, University of Salzburg). 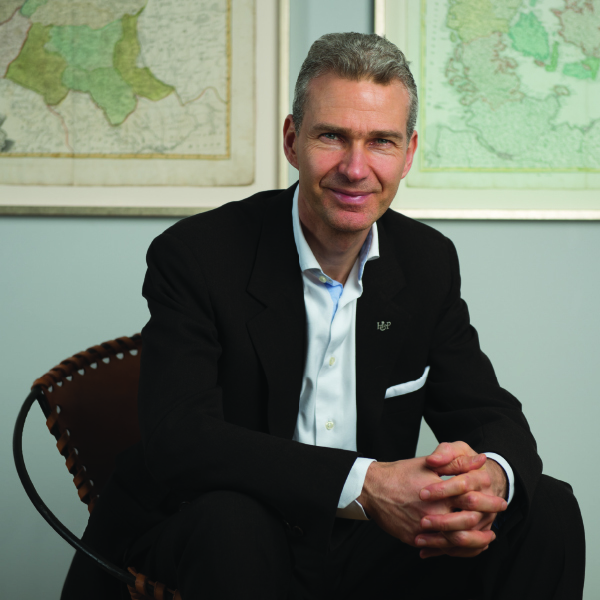 Dr. Christian H. Kälin, TEP, IMCM, Chairman of Henley & Partners, is considered one of the world’s foremost experts in investment migration and citizenship-by-investment, a field he pioneered. Holding master’s and PhD degrees in law from the University of Zurich, he is a sought-after speaker and advises governments and international organizations. He is the author, co-author, or editor of many publications, including standard works such as the Global Residence and Citizenship Handbook, the Henley & Partners – Kochenov Quality of Nationality Index, and the Switzerland Business & Investment Handbook. The firm also runs a leading government advisory practice that has raised more than USD 7 billion in foreign direct investment. The firm has been involved in strategic consulting and in the design, set-up, and operation of the world’s most successful residence and citizenship programs. For a detailed overview of the methodology behind the QNI, click here. Everyone has a nationality of one or more states. States differ to a great degree: Russia is huge, while Swaziland is small; Luxembourg is rich, while Mongolia is less so. Just like states, nationalities themselves differ too. The key premise of the QNI is that it is possible to compare the relative worth of nationalities — as opposed to, simply, countries. The QNI therefore provides a comprehensive ranking of the quality of nationalities worldwide. To ensure a high level of reliability, the creators made a principled choice not to make it a perception-based index. A wide variety of strictly quantifiable data is used instead to gauge the opportunities and limitations that our nationalities impose on us. For that purpose, the QNI measures both the internal value of nationality, which refers to the quality of life and opportunities for personal growth within our country of origin, and the external value of nationality, which identifies the diversity and quality of opportunities that our nationality allows us to pursue outside our country of origin (where the majority of the holders of the nationality have the unlimited right to reside). 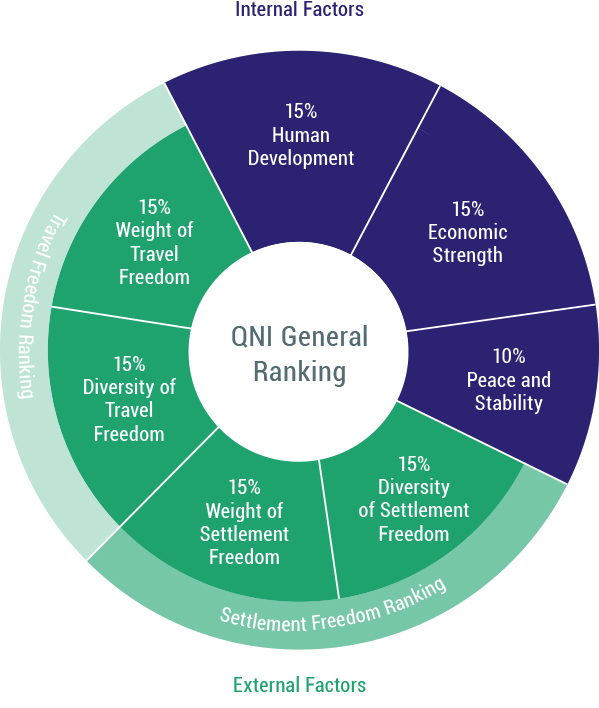 Internally, the QNI looks at how successful a country is in terms of human development, economic prosperity, and peace and stability. It is better to have the nationality of a country whose citizens have long life expectancy, a good schooling system, and a high level of prosperity — such as France or New Zealand — than that of a country that offers lower levels of security, schooling, and healthcare to its nationals — such as South Sudan or El Salvador. It is also better to have the nationality of — and, as a consequence, to enjoy the right to work and reside in — a country with a large economy, such as the US, than that of a tiny country, however prosperous, such as Monaco. And one would prefer to possess the nationality of a peaceful and stable country, such as Iceland, than that of a country with security risks, such as South Korea. External factors are no less important, however: some nationalities allow their holders to travel all around the world unobstructed (think of the French nationality, for instance), while others make tourist and business travel dependent on acquiring endless visas, or, at times, de facto impossible (think of North Korea). More importantly, however, some nationalities come with the right to be welcomed by other countries and societies — the right to home treatment. In this sense, possessing one nationality can amount to enjoying plentiful rights, including work and settlement rights, in a number of states, rather than in just one. The nationality of Liechtenstein, although a tiny country, gives its bearers full access to all the EU member states and all the countries of the European Economic Area: Liechtensteiners are at home in 33 countries, enjoying all the rights that the bearers of the local nationalities there enjoy. Compare this with Canadian nationality, which is associated with no such extra-territorial rights at all, and the difference becomes clear. To reflect the added value of both in the best possible way, QNI looks at two criteria. The first is the sheer number of other jurisdictions where one can travel to or settle in while holding a particular nationality: Liechtenstein is better than Canada, and Germany is better than Turkmenistan, because the diversity of the places you can visit or live in with your nationality is important. The second is exactly what kind of countries one can travel to or settle in with a particular nationality, taking the Human Development and Economic Strength of every possible destination into account. Under this spotlight, being able to travel to France visa-free is of greater added value than being able to visit Syria visa-free. The same with settlement: the unconditional right to work and live in Germany that is associated with an Icelandic nationality, for instance, places Icelanders above Chinese nationals, for instance, since the Chinese nationality does not even allow settlement or work in the totality of the territory of the issuing state itself. 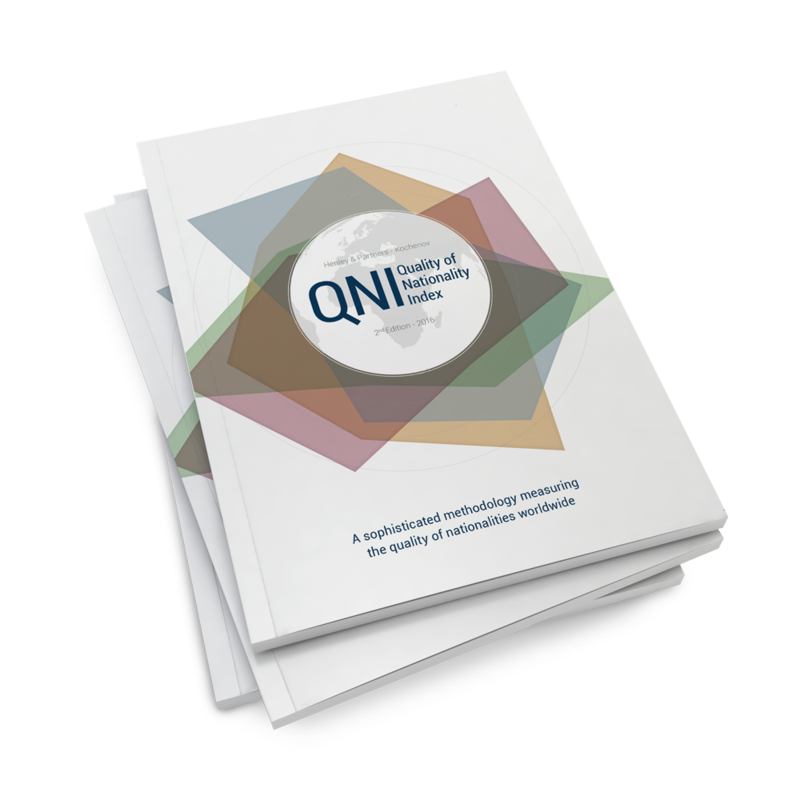 All these factors considered, the QNI was born: the QNI allows for an objective and impartial comparative assessment of the value of all the nationalities in the world, taking both internal and, crucially, external factors into account. This assessment produces a clear account of which nationalities are objectively better than others, working against two unhelpful mythologies. Firstly, the QNI proves that one cannot possibly be correct in stating that all nationalities and passports are equally good. Some nationalities are radically better than others: being born an Estonian gives one a huge advantage over the liability brought about by a Somalian nationality, for example. Illustrating this visually is now very simple. Secondly, the QNI proves that it is not true that the most prosperous and economically important countries endow their citizens with the best nationalities: while China is an economic giant, its nationality has a very modest objective value, and while Liechtenstein has a micro-economy compared to that of China, its nationality is world-leading. Some nationalities are great, while others are quite simply terrible. Now, we can see which is which. Updating this index annually will make sure that an up-to-date picture of the quality of world nationalities is readily available at any moment in time, illuminating medium- to long-term trends in nationalities’ development. The QNI ranks nationalities on a scale from 0% to 100%. Scores are rounded to one decimal place. These rankings consist of both internal and external factors. The weighting of internal and external factors within the QNI General Ranking is 40% and 60% respectively, both built from critical sub-elements, as outlined below. Human Development is measured using the United Nations Development Programme Human Development Index which includes three dimensions of human development: health, education and standard of living. Economic Strength is measured using figures from the International Monetary Fund showing a country’s share of world Gross Domestic Product (GDP) at Purchasing Power Parity (PPP). Where no sufficiently recent and/or reliable PPP GDP data could be used, (non PPP) GDP data from the World Bank is applied. Peace and Stability is measured using figures from the annual Global Peace Index published by the Institute for Economics and Peace. Diversity of Travel Freedom is directly based on the number of destinations to which the holder of a particular nationality can travel visa-free or with a visa-on-arrival for short-term tourist or business purposes. To measure the Diversity of Travel Freedom, the QNI uses data provided by the International Air Transport Authority (IATA), which manages the largest and most accurate database of worldwide visa regimes. Weight of Travel Freedom is based on the value of the destinations to which the holder of a particular nationality can travel visa-free or with a visa-on-arrival for tourist or business purposes. 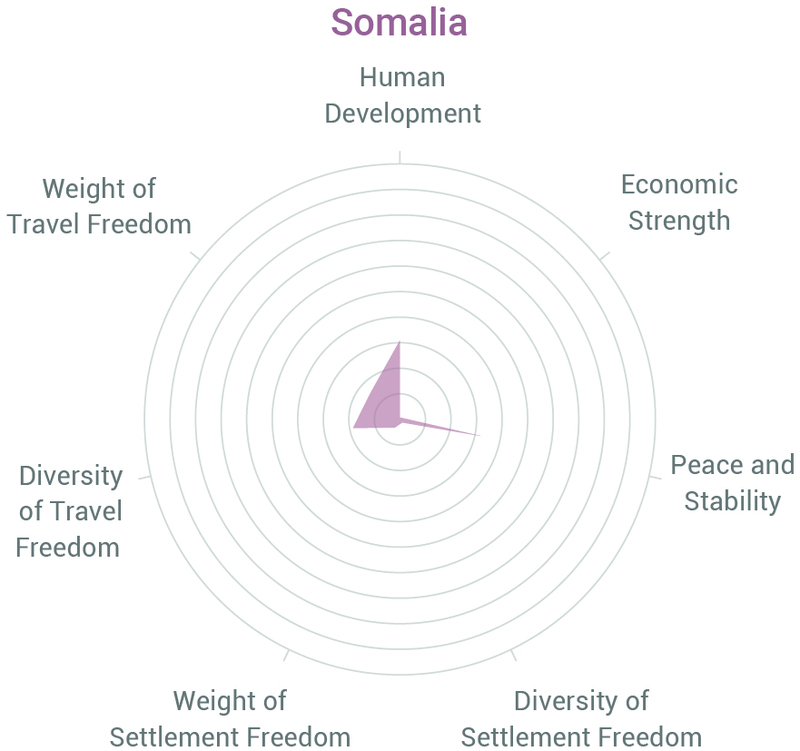 Unlike the Diversity of Travel Freedom parameter, therefore, here we value all destinations on the basis of Human Development (50%) and Economic Strength (50%). Diversity of Settlement Freedom considers the number of ‘full-access’ countries and territories: that is, countries and territories with their own border controls and immigration regimes where the holders of a given nationality can work, live, and settle freely with either no or merely minimal formalities. All the data on Settlement Freedom is based on extensive literature research and consultation with experts on free movement from all the world’s regions, resulting in a broad overview of global work and settlement opportunities outside a person’s country of nationality. Weight of Settlement Freedom measures the value of full-access countries based on their Human Development (50%) and Economic Strength (50%), thus following the same methodology as the one applied to the calculation of the Weight of Travel Freedom, but focusing on the destination countries and territories where the holders of a given nationality can settle and work visa-free, as opposed to the mere entitlement to a visa-free or visa-on-arrival possibility for short-term visits. This QNI edition represents the status quo on 28 July 2017. The QNI divides the nationalities of the world into five quality-based tiers — Extremely High Quality, Very High Quality, High Quality, Medium Quality, and Low Quality — giving a very clear picture of the standing of each nationality in the world at one glance. These tiers are distinguished according to a percentage scale. The Henley & Partners – Kochenov Quality of Nationality Index (QNI) provides a comprehensive ranking of the quality of nationalities worldwide. It can be purchased online from Amazon.com, using the link below. Thank you for your interest - your enquiry has been emailed to a QNI representative. Unfortunately your message has not been sent due to an internal error, please try again later. 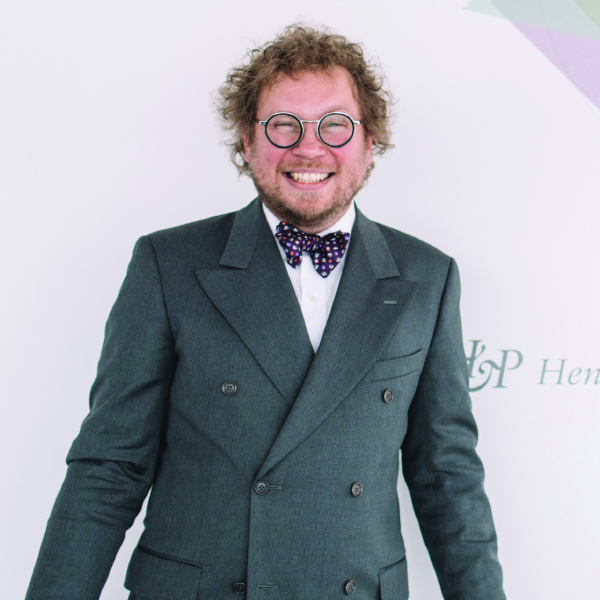 The Henley & Partners – Kochenov Quality of Nationality Index (QNI) is the first index of its kind to objectively rank the quality of nationalities worldwide. It explores both the internal factors (such as economic strength, human development, and peace and stability) and the external factors (including visa-free travel and the ability to settle and work abroad without cumbersome formalities) that make one nationality better than another in terms of a legal status through which to develop your talents and business. The QNI is the result of a successful cooperation between Henley & Partners, the global leader in residence and citizenship planning, and Prof. Dr. Dimitry Kochenov, a leading constitutional law professor with a long-standing interest in European and comparative citizenship law.